Olur is an Orc ranger living in the Orc stronghold of Mor Khazgur, found west of Solitude and northeast of Markarth. He is the son of tribe leader Chief Larak and his forgewife Shuftharz. As the son of the forgewife, Oluf spends a lot of time working the forge with his mother, and he helps her smith every day between 8am and 8pm. As any young Orc, he is then expected to work the local Mor Khazgur Mine which he does from 8pm and all through the night, until it is time to help out at the forge again. He never sleeps, but occasionally takes a nightly meal inside the mine and talks to his fellow miners, Gul and Ghamorz. 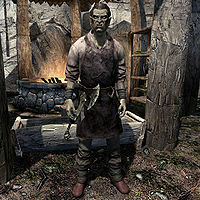 He wields a leveled war axe and carries a leveled bow (both weapons go to Orcish quality at level 6) with a number of leveled arrows (Orcish quality at level 9). He wears a blacksmith's apron and a pair of shoes. He carries the key to Larak's Longhouse and a selection of middle-class items and gold. He is not very talkative and will only explain briefly about his daily routine: "I work in the forge and the mines. Mother says it pleases her and our people. ", "Even good hammers warp metal if struck without care." and "Mother tells me to shape metal with focus and strength." Larak: "The way you and your mother forge weapons is impressive." Olur: "It's simple Orc smithing practice, my chief. Nothing that hasn't been passed down for years." Olur: "I served in the Legion. Perhaps I'll show you some of their technique one of these days." This page was last modified on 20 March 2013, at 05:06.